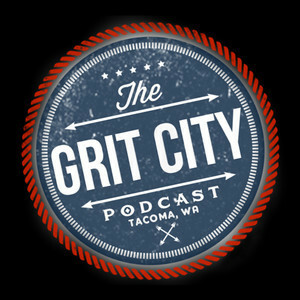 The Grit City Podcast is a weekly podcast, hosted by four friends from Tacoma, WA. - Affectionately known as "Grit City" to the people who know and love it. Highlighting local business owners, entrepreneurs, authors, artists, and unique characters that personify the blue collar, hard work ethic people associate with “Grit”. The founders and original hosts are technology workers who met on the job and bonded over common interests. The Grit City Podcast was launched during the summer of 2014 and had over 120 episodes between 2014 and 2017. The Grit City Podcast relaunched in 2018 with more friends and family involved. GCP's goal is to become the "Must Listen" podcast around Seattle and the Pacific Northwest, with a fan base of people around the world. People who identify with "Grit" and understand that the reputation is real. For early access, extra content, streaming access, wearable art, and The Parties you can Become a Patron!